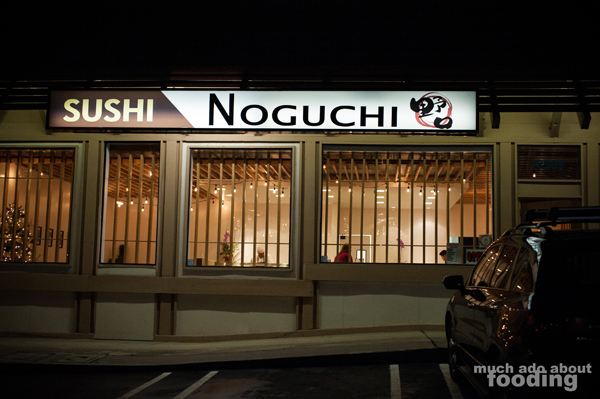 I don't see how I can expect anything less than fantastic whenever I go to Sushi Noguchi. Of course, this causes me to blab my mouth off and drag other people along (or if they say they love sushi but haven't been, I accompany their first visit here). We recommended our friend Craig to come here and enjoyed dinner ourselves. 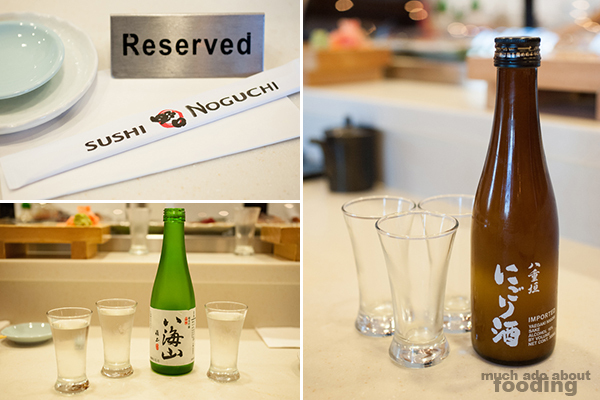 It is always a treat at Sushi Noguchi not only because everyone there is so friendly and gracious but also because the fresh fish itself is a present. We started off with some sake to get us going. Duc and I ordered a few dishes but overall, we shared an omakase. One of the great things about omakase is the constant feeling of wonder and curiosity to see what the chef will provide. Chef Hiro-san is such a particular artisan of his craft that we just enjoyed watching him prepare dishes (we sat at the bar) instead of seeing if it was our plate or not. The starter was Deep Fried Smelt served with a Sweet, Vinegar Sauce, easily something that might turn another person off because of it being smelt. However, don't deny yourself this salty treat! The sweetness of the sauce helps mellow out smelt's natural saltiness. 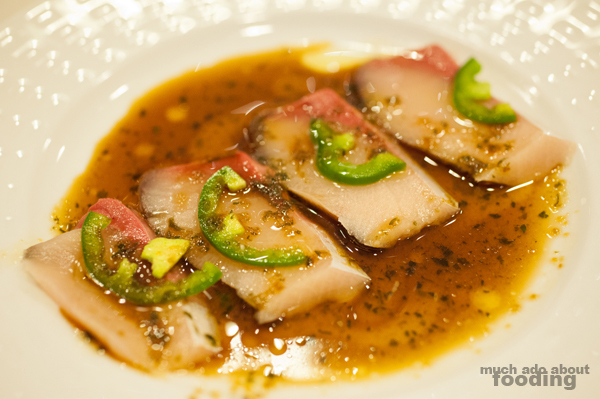 One of the regular menu items we ordered was the Yellowtail Sashimi in a Jalapeño Sauce because yellowtail is my favorite. While the cuts here cannot compare to the earth-shattering cut I had in Vancouver, they are still certainly amazing. The natural buttery-ness of the yellowtail shone brilliantly despite the sauce, which is still a nice accent to the fish itself. Then a plate of generously thick Jumbo Scallop with Uni & Caviar came out; if you haven't had this texture before, it may take some getting used to. 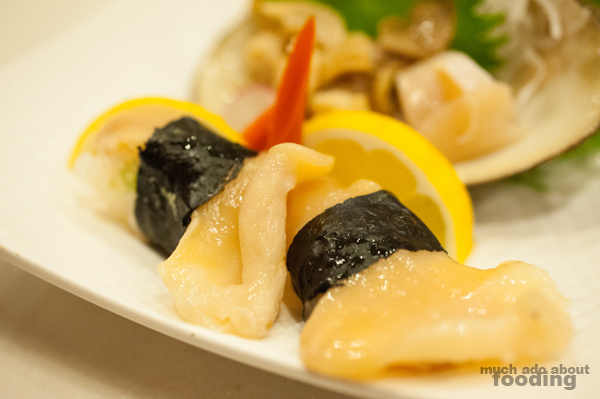 The scallop is reminiscent of a briny piece of cooked tendon but a bit harder. There is definitely an edge to it. 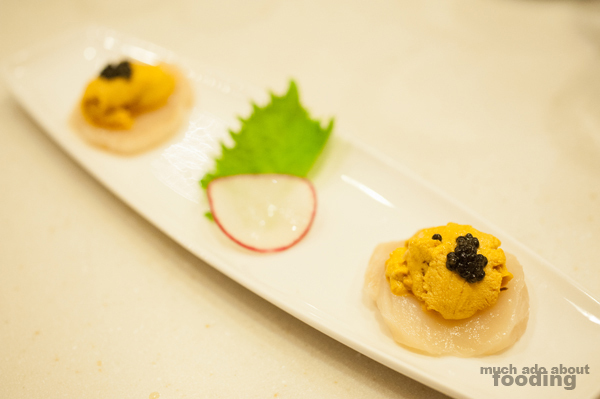 With fresh and smooth uni atop and bursts of caviar flavor, these were great for scallop lovers. 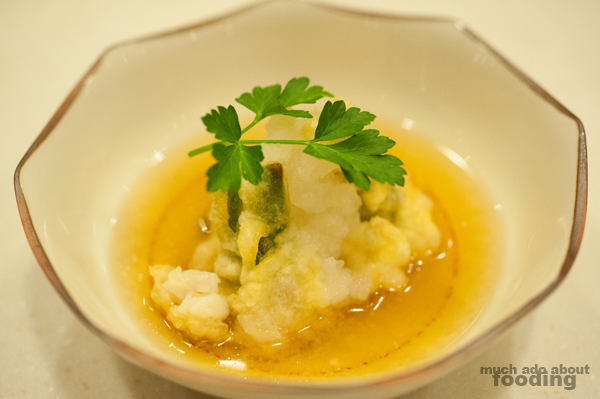 Then a regular menu item order came out of the Ikaten (tempura squid) which was hands down one of the best cooked choices we made. Lightly salty and crunchy, it satisfied so many cravings. 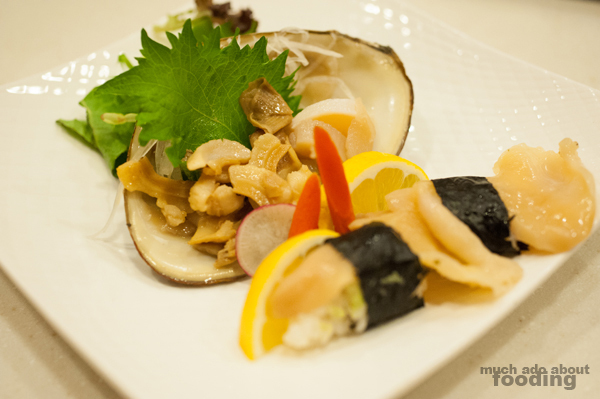 The next plate in the omakase series was a beautifully presented Orange Clam, cut into many different styles. We really thought there were other items on the plate but Chef assured us we were just having the various parts of the clam. 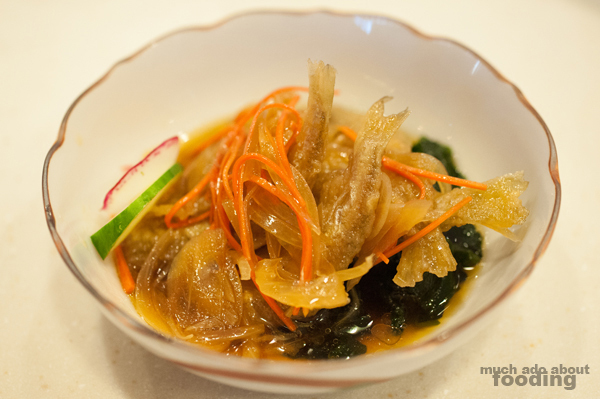 I particularly was in favor of the smaller slices nestled within the shell itself as they were briney and crisp, like pig ears or hard tendon. Overall, a very fresh clam that we dispensed of quickly. 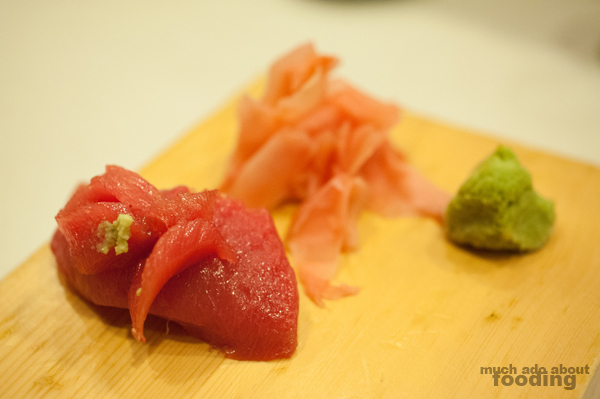 Then Craig got the treat of Bluefin Toro which was cut oh so handsomely. He so nicely let us have some and using just my chopsticks, I was able to separate a piece to eat. Melt-in-your-mouth goodness, yes! It was a pleasant pre-show to our next plate that we asked for because Duc and I love it so much - the Live Shrimp. Live shrimp deftly killed in front of us, taken apart, and quickly deep-fried before being presented in a fun and unique manner makes for a good meal! Salted slightly and full of crunch and bite, this is not a dish to forget or recommended to miss. 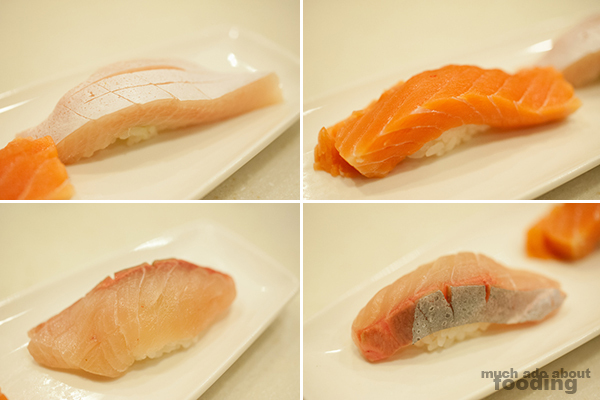 Of course, you can't avoid some nigiri. 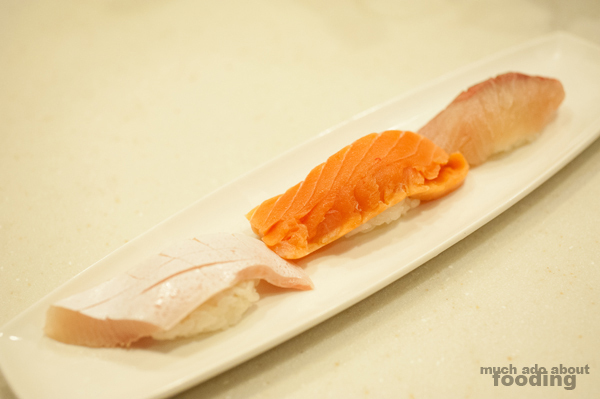 Rolled out was a plate of Kampachi, King Salmon, and Yellowtail Toro followed quickly by King Crab. Yes, yes, yes. I had a piece of the Yellowtail toro and just sat there quietly contemplating if I should order a full plate of that for myself. 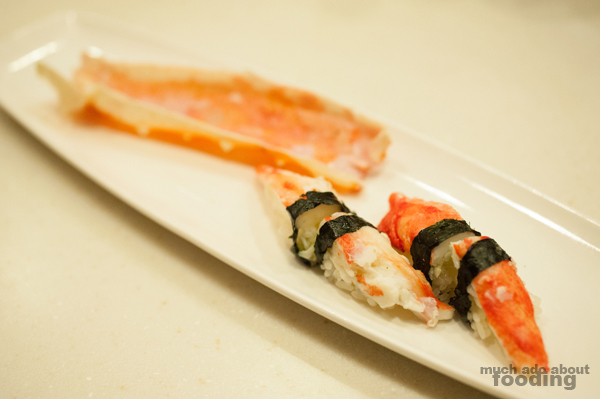 The King crab was subtly sweet with a fine texture. 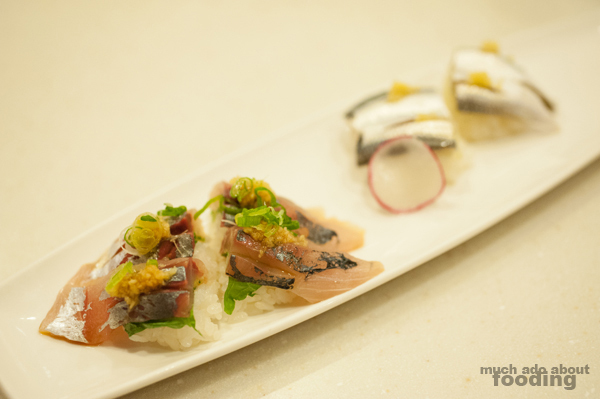 Our last nigiri plate featured some fish that one might not typically see in a sushi restaurant: Spanish Mackerel & Gizzard Shad. I must say that if you were apprehensive coming in here about raw fish, the gizzard shad would probably scare you off since its gleaming skin was still intact on the cut. Fret not though! 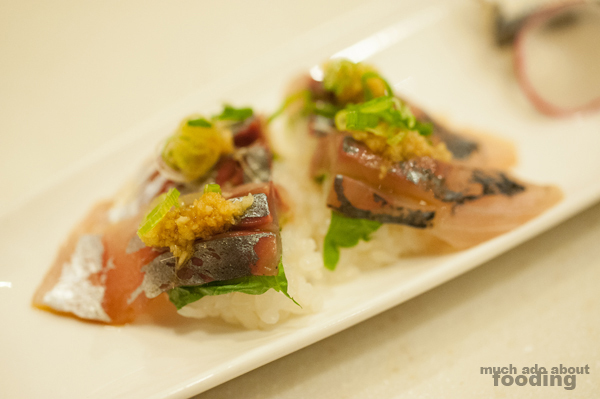 The shad was soft but boasted flavor and a similar sourness you naturally find in yellowtail. I was a fan. 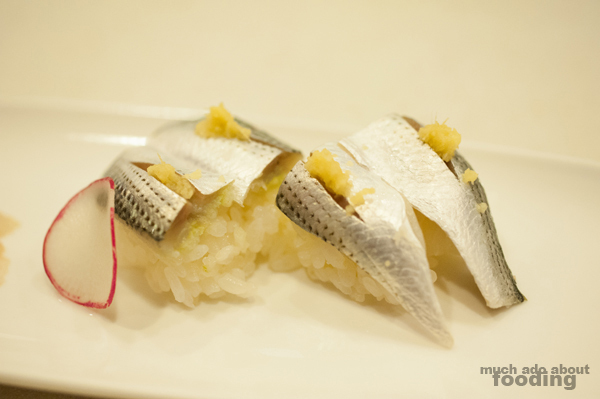 The Spanish mackerel was lovely with a touch of their own sauce and coupled with the green onions. 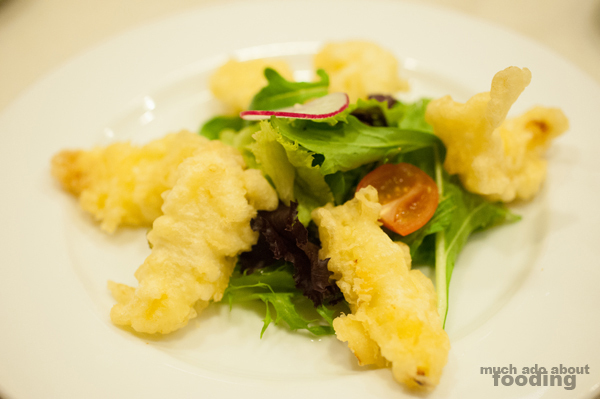 Then Chef insisted we have some Shishito Tempura so we did, and it was a tasty finish to the fish. The shishito peppers gave a vegetal end that we only glimpsed in the wasabi smidgeons we had underneath each fish cut in the nigiri. By the way, you must try their wasabi as it has more authenticity than the reconstituted paste at other places! I mean, you really can taste the vegetal sweetness that real wasabi touts. 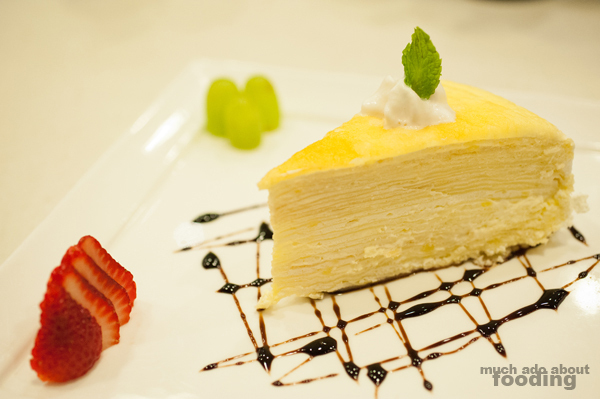 Alas, how could you leave the place without having a slice of their Mille Crepe dessert? It is always such an occasion when we get this because we're fascinated by the amount of effort that goes into this multi-layer cake. Thin crepe and thin spreads of cream make it an airy but still nearly decadent dessert. 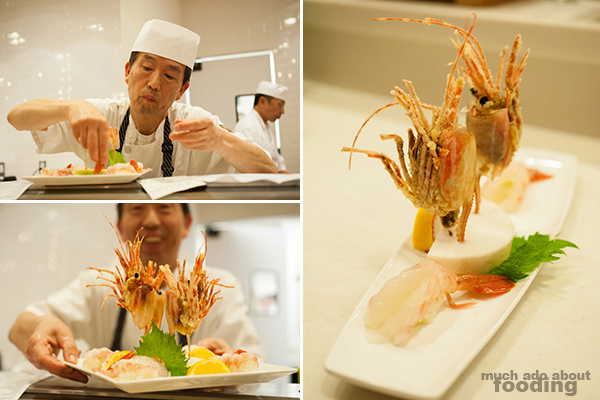 Our thanks to Chef Hiro-san for the choices he made for our omakase and to Jun for her constant amazing service! The food looks almost too pretty to eat. I am going to bookmark this restaurant on my "to eat" list. By far my favorite sushi restaurant. Hiro and Jun are amazing! Thank you for the promo love =]. Have a great weekend too Jun!